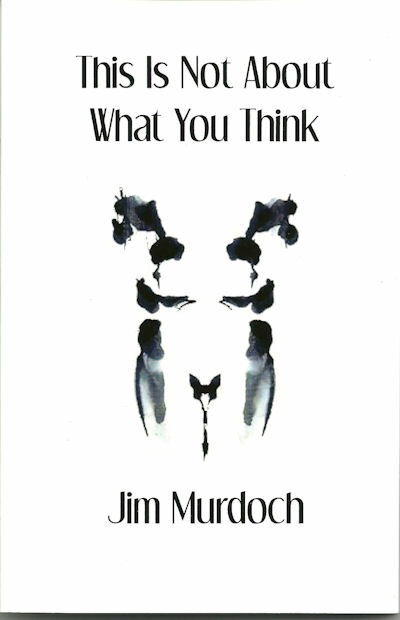 I’ve been reading, with great interest, Jim Murdoch’s new poetry collection, This Is Not About What You Think. It’s a well-produced book, published by Fandango Virtual. As Jim says in his introduction ‘None of my poems are very long. I’ve long held the belief that writers should say and get off the page’. Refreshing and honest, and that also describes Jim’s poetry. He’s what I would describe as a ‘personal’ poet, not that the poems are necessarily autobiographical, but that they are based on his personal experience, or so I assume (correct me if I’m wrong Jim!). Advice to Children is an engaging mini-sequence which pops up in several places, there are poems on his own childhood, his parents, his adult life and loves. There is that distance however, as implied by the title, that leaves enough room for the imagination. And he approaches these subjects with an objectivity which could never be mistaken for detachment. He cares about people, and it shows. There are occasional literary nods, to Larkin, to Erica Jong and to William Carlos Williams among others. The book is in seven sections, but the section marks are not rigid compartments – subjects come and go between sections. Intriguingly, and unusually, Jim’s Appendix lists the date of composition of the poems in the collection, showing that they span a long period from 1979 to the present. This is a fine collection by a thoughtful, subtle and perceptive writer, and it deserves to be widely read. This entry was posted in Uncategorized and tagged Jim Murdoch, reviews. Bookmark the permalink. I’ll be ordering a copy this month, looking forward to reading his poems in bulk, as it were, having enjoyed reading them on his blog over the last couple of years. You’ve fair made my day, Colin. Thank you very much. There is actually an eighth ‘Advice to Children’ poem sitting on my desktop – has been for weeks – but I just can’t decide if I’m ready to abandon it yet. The idea behind them was to produce poems in simple language that aimed to pass on the kind of truths we’d want our kids to have but that no matter how simply put they’ll never get.